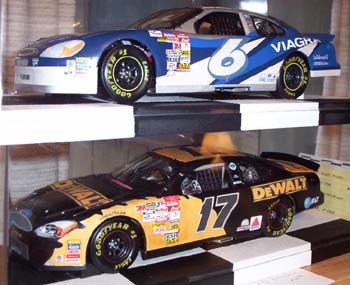 These are photos of Matt Kenseth's 2002 Winston cup ride, along with a fictional Mark Martin alternate i did, baded off of the 1998 Eagle One car he won the winston in. All decals are slixx with the exception of the major sponsor logos, those are homemade. 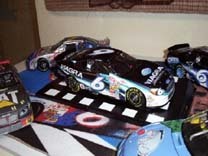 This is my favorite drivers 2002 Winston Cup ride, in 1:18th scale. I have the smaller one done by Team Caliber, but i wanted this one. 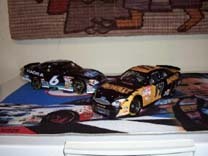 When i found out that no one makes Roush cars in 1/18 scale, i took it upon my self to make it. Contingencies are from slixx, major sponsors were homemade. I really enjoyed making this car. It was a challenge. 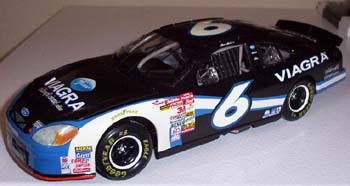 I dont have the pictures of it, but i also have a custom Mark Martin action figure with the pfizer uniform to go with the car.